The place has personality, stands its ground amidst Rochester’s gentrification. For years I’d drive by the green building, catching a glimpse of the Village Lamp Shop. “Let me tell you my story,” the window would say. Fond of old things and stories, I at last resurrected a brass lamp that hadn’t worked in ages. It was a housewarming gift from Gram, my husband’s paternal grandmother. She brought it to our apartment in Bay City in winter 1970. I baked a pecan cake with caramel sauce for her, my father-in-law, and two younger brothers-in-law—our first guests as newlyweds. I loved Gram. She was the first adult on Mel’s side of our marriage to speak a vote of confidence in me as a wife and homemaker. Gram and Gramps owned a lodge on Presque Isle where Gram served food she cooked and baked from scratch. In her honor, I drove Gram’s lamp to the shop. It was high time to let her light shine within my home again. 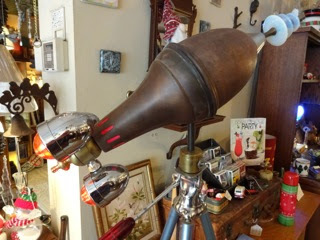 The shop’s doorbell introduced quirky to grand lights that hung on walls and from ceilings and sat on every possible surface. The floor creaked as a man walked toward me from the building’s hindmost room, backlit from a window like a scene from Dickens’ The Old Curiosity Shop. I can’t remember which Beuthien brother I first met, third generation of their family business. 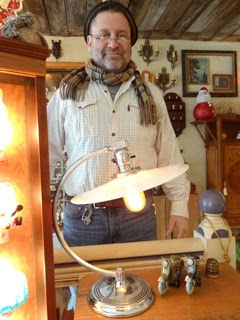 Bill and Jim have since repaired most every lamp in my household—vintage and antique types that called my name. Orphans with unknown stories. They’ve come from Silver Quill in Warren, LaBelle Antiques in St. Claire Shores, and the Armada Flea Market. Stories are inseparable from Bill and Jim’s vocation. “We believe in the styles and traditions of the past and are eager to expand upon them,” Bill said. They hold BFA degrees from Northern Michigan University. Bill’s interest is illustration and design. Jim’s is metal smithing and sculpture. This legacy began with their grandfather in London, England in the early 1900’s. Eight-year-old James Weddell lit oil lamps on the Jewish Sabbath for one cent per household, including minor repairs. During World War II James made his way to Selfridge Air Force Base via the Royal Air Force. He decided then to start a new life in America with his wife and two daughters. Dear Reader, this is by no means the whole story of the Dickensian character of the Village Lamp Shop. That you need to see and hear yourself. For old world craftsmanship and service, you’re welcome to stop by 139 Romeo Road. But beware, a retro spaceship mounted atop a recycled tripod might catch your eye and provoke stories of your dad’s home movies. And don’t forget to take the lamp that needs repair.